We had some awesome pork chops for lunch today. I don’t usually go for the apple and pork combo but this was pretty tasty. Easy to do and quick to make. Heat cup of apple cider over medium heat. Add brown sugar, cinnamon, and cayenne; bring to a simmer. In small bowl whisk together tablespoon each of the cornstarch and cold apple cider. Add to simmering liquid and stir until thickened. Pour into bowl and set aside. In same skillet heat olive oil. 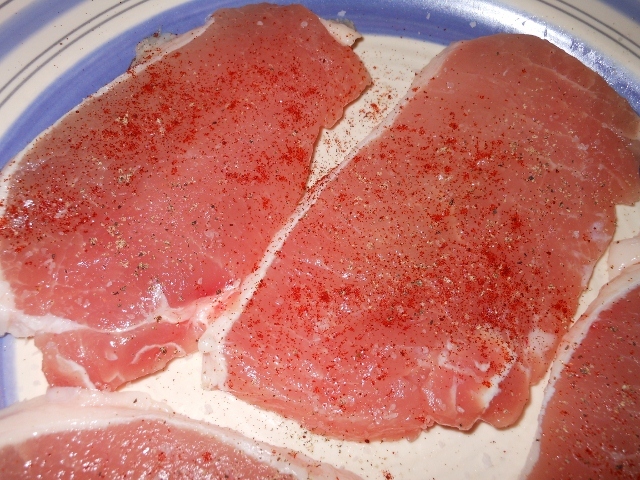 Season pork chops if desired with a little salt and pepper. 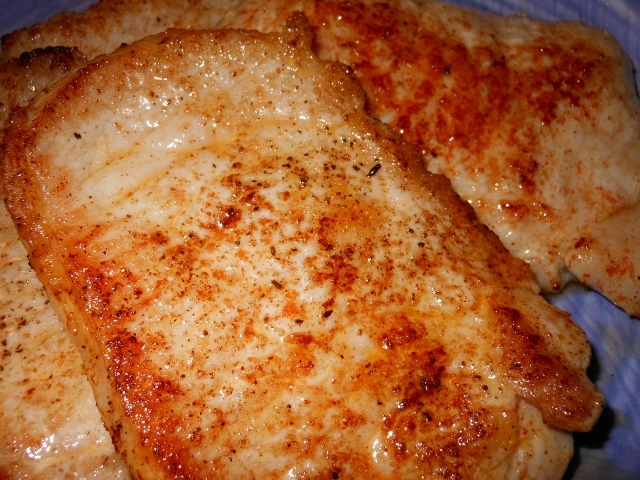 Cook chops for 3 – 4 minutes each side. 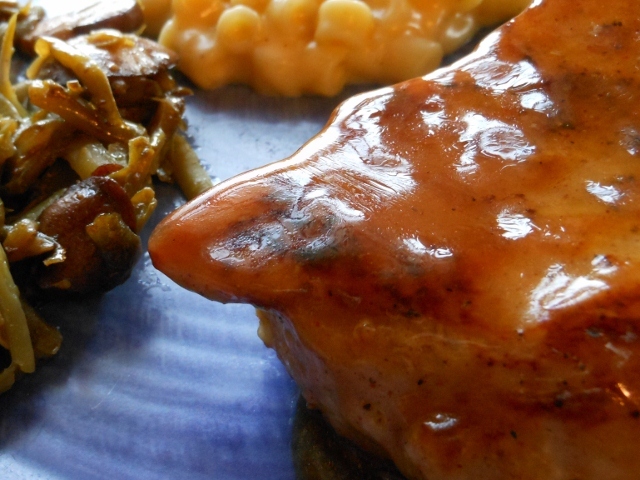 Pour apple cider glaze over the top and cover. 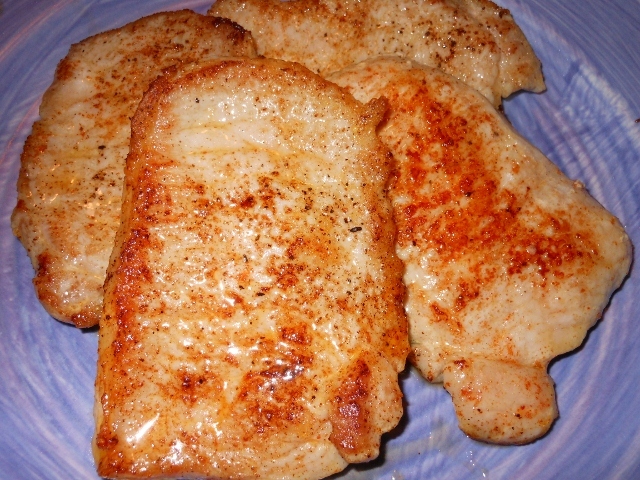 Reduce heat to low and simmer for 10 – 15 minutes; until chops are cooked through. Stir and flip the chops occasionally to keep the sugars from burning and sticking. Serve with extra glaze for dipping. Charles gets up very early each workday and I try to make sure I have something easily available for breakfast. Today I thought he would enjoy some pork chops and eggs in the morning so I picked up a package of thin cut pork chops. I went with a very quick and easy fix for them and cooked them quickly until just finished so that they will reheat nicely. In large skillet heat olive oil over medium high heat. Season as desired. I like the hint of cayenne along with salt and pepper. 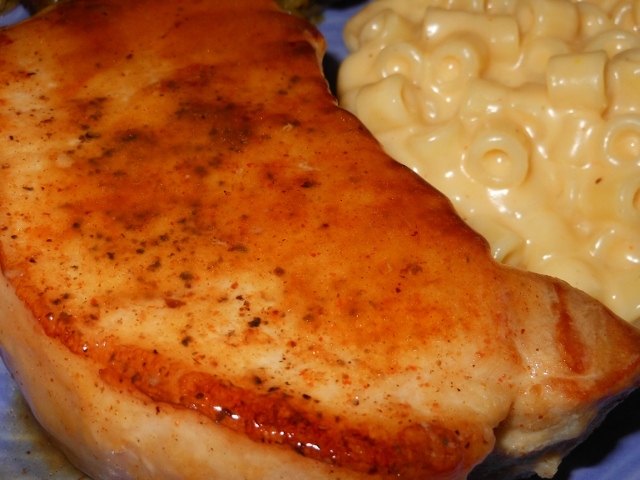 Once skillet is hot add pork chops and cook for 3 minutes each side or until cooked through.